The Port of Hood River was created and incorporated on July 28, 1933 as a result of the Bonneville Dam Project due to the expressed desire by the Oregon State Legislature and the United States Government to develop industrial lands in the Columbia River Basin. The first meeting was held August 12, 1933 with a Commission of five elected members. Five Commissioners, elected throughout the district for four-year terms, still guide the Port of Hood River today. AIRPORT: First steps were taken by Hood River County to establish an airfield at the present site of Hood River Airport. BRIDGE: The owners of the bridge, built in 1923 by the Oregon-Washington Bridge Co., approached cities, counties, and ports on both sides of the river regarding purchase of the bridge. All declined except the Port of Hood River. BRIDGE: The Port of Hood River purchased the interstate bridge for $800,000 in 1950. Toll for autos was $.75; truck toll varied (by weight) up to $5.00. The Port spent $725,000 in bridge improvements replacing timber trestle with two steel girder spans; auto toll was reduced to $.50 in 1954. WATERFRONT DEVELOPMENT: Several significant property acquisitions took place in the 1950s along the waterfront to prepare for future fill and development of usable land in the area. The State of Oregon, U.S. Government, Corps of Engineers and Bonneville Power Administration all cooperated in the fill project. The property east of the bridge was filled and prepared for development. BRIDGE: Bridge improvements in 1965 included replacing railing and curbs with steel posts, adding mercury vapor lights; and replacing the toll house with a sheet metal building. In 1967, United Telephone Company added a cable across the bridge valued at approximately $4 million. WATERFRONT DEVELOPMENT: Eddie Mays Inn (now Hood River Inn) was constructed on the eastern fill area in 1964. Fill of the second waterfront site, located west of the Hood River, was completed in the 1960s. Both properties supported the development of many business uses, including industrial, commercial and recreational. The waterfront planning and development continues to be an ongoing project for the Port of Hood River as the area’s community and economy changes and diversifies. AIRPORT: Hood River County in 1976 deeded the Hood River Airport to the Port of Hood River, which agreed to assume ownership and upgrade the facility. The Port purchased additional land in order to provide space for potential future expansion of the airport. In 1978, 24 T-hangars were constructed for small private plane rental. BRIDGE: 1971 and 1972 bridge improvements included portal bracing; guardrail replacement; repainting; and replacing operations of the river navigation and aerial obstruction lights with photocell. In 1973, the estimated cost of replacing the bridge with an identical structure was $5,600,000. In 1976, renovation began for mechanical maintenance, sandblasting, cleaning and painting. In 1976, the estimated cost of replacing the bridge with an identical structure was $7,900,000. In 1977, ten spans were welded; new power and control cable supports were installed; and marine radio was installed. Mechanical traffic axle counters were installed in 1978, and additional improvements to the concrete supports and to the communication system were made. ECONOMIC DEVELOPMENT: A 29-acre tract of land west of Odell was purchased by the Port of Hood River to develop a light industrial park-which will later be named John Weber Business Park (JWBP). WATERFRONT DEVELOPMENT: The third fill project, in the Marina Park area, was completed in 1970 and the area’s general improvements began. In 1972, the first permanent moorage floats were installed in the marina. The Port Office Building was completed in 1973. A visitor dock was installed in the marina in 1975. In 1977, Department of Motor Vehicles moved into the Port office complex with Oregon State Police. The Hood River County Museum was built in Port Marina Park on land provided by the Port of Hood River. The Waterfront Industrial Park gained diverse industrial development from businesses such as Luhr Jensen, Western Power Products, Hood River Distillers, and Jantzen. The first Port of Hood River waterfront plan is produced in 1975. BRIDGE: Pier cap repairs were begun; United Telephone Service replaced their cable underwater between the towers. In 1980, the estimated cost of replacing the bridge to meet 1980 design standards was $35,000,000. Deck grating and repainting projects were completed. ECONOMIC DEVELOPMENT: Economic base generated on port-developed property in 1982: 19 businesses; $10 million valuation; $6,925,000 payroll; 710 jobs created; $172,000 property taxes generated. Port of Hood River purchased Wells Island in 1983. Diamond Fruit Complex: The 21-acre cannery complex was purchased in 1984 for $800,000. Yost, Grube, Hall Architects of Portland developed master plan and economic/market study of complex. In 1985, Waucoma Center and Graf Building began their rehabilitation and Wasco and Industrial Streets were reconstructed. The City of Hood River agreed to form an Urban Renewal District surrounding the Diamond Complex. The 50-year old cold storage plant was transformed into a modern telecommunications center, with the help of a $2.4 million bond issue. United Telephone Company of the Northwest began the process to purchase the building in 1986. In 1986, the Columbia Building renovation was completed and DaKine Hawaii moved in. Other businesses to take space shortly thereafter in the Columbia Building included Hood River Brewing Co., makers of Full Sail Ale, and Kerrits Activewear. From 1988 to 1990, reconstruction of Industrial and Columbia between 3rd and 7th linked downtown and the Diamond Complex to the Waucoma Center. The project included new water mains, sanitary and storm sewers, underground electrical, streetlights, curbs and sidewalks, and paved streets. A $521,000 grant/loan from the state along with additional funding from the Port ($307,000) and the City ($104,000) paid for these improvements. In 1989, the Port sold the property at 7th and Columbia and the Lodge at Hood River Condominiums were privately developed in that space. WATERFRONT DEVELOPMENT: Marina swim beach opened in 1980. Hood River Waterfront Plan, Phase I, sets waterfront development in process in 1983. In 1985, a pedestrian bridge was built across the Hood River to link Marina Park with downtown. Marina Park restrooms were remodeled adding showers. Cruise ships began stopping at the commercial dock in 1989. Also in 1989, the Hood River Waterfront Plan was updated. AIRPORT: In 1995, airport improvements included a new north access road, paving and sealing the runways and taxiways, and adding a new parking area. An FAA grant of $397,000 helped fund the project. New fuel tanks were installed and 12 new T-hangar spaces and a helicopter hangar were constructed in 1997. In 1998, the airport was dedicated in honor of Ken Jernstedt, the decorated war hero, former mayor, and long time civil servant. BRIDGE: Bridge study completed and recommendations are made for projects to extend the useful life of the bridge in 1994-estimated cost of $12-14 million. In 1994, the toll was increased by $.25 and discount books were offered to frequent users. The increased revenue was placed in the Bridge Repair and Replacement Fund, to be spent solely on bridge repair and upgrades. Phase One Seismic Retrofit was completed in 1996 to strengthen bridge. In 1997, the Washington approach was widened at a cost of $1.6 million. In 1998 the estimated cost of replacing the bridge was $175,000,000. The $2.1 million lift span upgrade project began in 1999. ECONOMIC DEVELOPMENT: Diamond Fruit Growers’ office building located at 3rd & Cascade was sold in 1990 by the Port-the first Diamond property to be sold after rehabilitation. Full Sail Brewing purchased the Diamond Fruit Cannery building and built new facility in 1995. In 1996, the Diamond Complex’s Graf Building was sold. The Port contracted a study of industrial land availability with the results showing that only 28 acres remained. Land at 5th and Cascade was transferred to the City of Hood River for the construction of a parking lot and a $350,000 grant was obtained for the project. Also in 1996, the Columbia Gorge Economic Development Association was formed as a coalition of all economic development agencies in the Gorge, including the Port of Hood River, with the mission of pooling resources to cooperatively market the bi-state Mid-Columbia region. In 1997, the Port partnered with Pacific Power to create a software incubator project at their Tucker Road facility. In 1998, fifteen years after the purchase of the Diamond Complex, the Port retains ownership of only two buildings. All others have been sold back to the private sector and are back on the tax rolls. JWBP: In 1990, Hogg & Davis and Wilbur Ellis establish businesses in Odell at the new John Weber Business Park. In 1993, the Port and Hogg & Davis donated land to the Odell Improvement Committee to create a two-acre day park at JWBP. In 1994, Power Design and Round Top Window Products were new tenants in the completed 20,000 square foot tenant building. In 1997, Hood River Supply purchased 2 ½ acres of property to expand their business. The Timber Incubator Building was completed with grant funds from U.S. Forest Service and Rural Economic and Community Development. Within two months, all spaces were leased in the 10,080 square foot building. WATERFRONT DEVELOPMENT: In 1991, Wells Island was sold to the Trust for Public Land and then subsequently sold to the U.S. Forest Service. An additional dock was added to the Marina moorage. Construction of the Event Site began for a cost of $1 million, using $317,000 in lottery funding, and improving the cruise dock as well. The Hood River Waterfront Plan was updated in 1992. Beginning in 1993, Clark Door building began its transformation into the Hood River Expo Center exhibition hall and Visitors Center. 71 cruise ships stop at the commercial dock in 1993. National trade shows began booking events into the Expo Center. A 150-foot extension was built on cruise dock allowing larger and multiple cruise ship dockings. A community Marina Planning Committee process began in 1994 to study ideas and concerns for the future development of commercially zoned areas of the Marina. In 1995, the Waterfront Advisory Committee was formed as part of an agreement between the Port and the City of Hood River to prepare a plan for the waterfront. Marina moorage was expanded in 1995 to accommodate longer boats and new overflow dock constructed. A dedicated swimming beach was constructed in the Marina Park area. After two years of citizen involvement, the Waterfront Masterplan developed by the Waterfront Advisory Committee went to the City Planning Commission and City Council in 1996. The first Gorge Games brought in world-class windsurfing, kayaking, mountain biking competition to the waterfront in 1996. A public/private partnership agreement between the Port and D.M. Stevenson Ranch was entered into in 1997 for the development of Hood RiverFront Lodge on the waterfront, which included a new conference facility. New restrooms were constructed in the Marina parking area with funds from Fish & Wildlife and State Marine Board. In 1998, Port receives $500,000 grant for street and utility improvements for the Second Street extension project. A waterfront panel was appointed to study the development of a park on the waterfront in 1998. The old Jucho Building was demolished to make room for new Hood RiverFront development in January of 1999. The Marina Landscape Committee commissioned a landscaping plan from Karen Mirande and $95,000 was approved to complete the first phase of work. Visitors Center expansion was completed in 1999. In July of 1999, the Port Commission denied extension of the Stevenson agreement and put the waterfront development on hold. AIRPORT: Pat’s Beauty Bar building on Tucker Road was purchased in 1999 and then demolished in 2000, as part of the Runway Protection Zone required by the FAA. By resolution, the Port Commission changed the airport name to Ken Jernstedt Airfield on June 19, 2001. The Airport Master Plan update was completed in 2003. As part of the Master Plan, a residence and orchard was purchased in 2005 and the house was moved in 2006, which increased clearance. BRIDGE: The mechanical and electrical lift span improvement at a cost of $1.8 million was completed in the year 2000. The estimated cost of replacing the bridge was estimated to be $300 million in 2000. In 2000, the redecking and renovation planning began. The utility line replacement project was accomplished in 2002. The actual redecking project – costing $7.5 million – was completed in November of 2004. In 2006 and 2007, the Toll Plaza and approaches will be improved and electronic tolls implemented costing approximately $4 million. ECONOMIC DEVELOPMENT: The Columbia Building was sold in 2003 to Key Development Company. The Diamond Fruit Complex Big 7 Building was renovated to house Gorge Networks and the Columbia Gorge Community College Hood River Center, including the Integrated Technology Center. Classes opened to the public in the fall of 2004. At this time, Big 7 Building is the only Port-owned building that was part of the Diamond Fruit Complex renovation. WATERFRONT DEVELOPMENT: Landscaping of the Marina Green area, including irrigation and drainage, was completed in the spring of 2000. The 17th annual Harvest Fest at the Expo Center, second annual Pear and Wine Festival, and the first annual Jazz on the Water Festival in Port Marina Park were held in 2000. The Army Corps of Engineers dredged the Boat Basin channel to allow bigger cruise ships to pass through the channel from the Columbia River in 2000 and 2002. In 2000, the Columbia Area Transit (CAT) District was given permission by the Port Commission to build a transit station next to the Expo Center; however, they reconsidered the site when the RiverFront development fell through. In March of 2000, the Port and the City agreed to continue their work together to reformulate their vision for the waterfront development plan. Leland Consulting Group was chosen by the Port/City Task Force to develop a new master plan, which included zoning and implementation guidelines. Kiteboarding came to the waterfront “Spit” in 2000. Construction of two new restrooms at the Event Site and the Marina Park Beach began in 2000 and were completed in the spring of 2001. Because the Leland Plan was not economically feasible, the Port/City Task Force continued to work together on the waterfront zoning to complete the Waterfront Action Plan. In July of 2003, the Commission entered into negotiations with William Smith Properties to plan and develop the waterfront property. The 2nd Street Project engineering began in the fall of 2002. Work was completed on the Marina Park portion of the River Walk pedestrian access way in 2002 with the help of an Oregon State Parks grant. In 2005, the Commission pulled the mixed-use development rezoning and decided to develop the waterfront as a business park, with public amenities interspersed for recreation, bicycle/pedestrian riverfront trails, and water access. “Lot 6” was donated to the City of Hood River in January of 2006 for a waterfront park under terms of an intergovernmental agreement. The Park Development Committee began working on development plans in 2006. Maritime Services came to the waterfront boat basin in the spring of 2006 to refurbish yachts and build floating structures. In May of 2006, the new 2nd Street extension was constructed as a new entry into the waterfront area in anticipation of the Waterfront Employment project design and development work. WASCO BUSINESS PARK: The Port purchased over five acres of property on Wasco Street to develop a light industrial business park. Engineering and street work was completed in the 2003. The first building was completed in 2005 with Humanities Software being the first tenant. All other parcels were sold immediately and construction for new facilities for job creation and company growth began. JOHN WEBER BUSINESS PARK: All vacant parcels were sold in 2005 and 2006 except for Lot 7, with new buildings constructed for local businesses. AIRPORT: An FAA Airport Improvement Program Grant funded 95% of an Automated Weather Observation System (AWOS) and a Crack Sealing Project in 2009-2010. Also completed in that year was a new grass runway. On May 24, 2011 the Port adopted Ordinance 23, regulating conduct at the airport as part of a process to resolve through-the-fence issues raised by the FAA. In 2011-13, work began on the vacation of Orchard Road which was necessary to shift the main runway to meet FAA standards. Century West Engineering was hired to prepare engineering, design, and bidding services for the runway shift project, eventually awarded to K&E Excavating. Also in 2012, the Port installed a new concrete pad for the wash down area of Aero Spray, Inc., to bring the facility into best practices for spray plane operations. In 2013, the Port mourned the passing of Ken Jernstedt, former mayor, decorated war hero, and long time civil servant to whom the airport was dedicated in 1998. Photo credit: Hood River News. 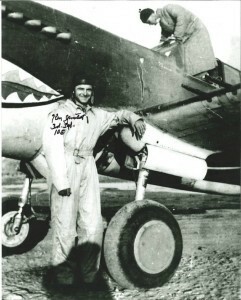 Flying Tiger Ken Jernstedt stands next to his plane during World War II. In 2014, the Port Commission authorized two contracts with Century West Engineering for airport projects: one for an updated Airport Master Plan (for which the FAA would cover 90% of cost), and the other for general engineering services as needed. The draft new Airport Master Plan was completed in 2015, with expected adoption in 2016. BRIDGE: In 2010, the Port commissioned a study from consulting firm w Planning + Design on non-motorized crossing alternatives for the Hood River Bridge. The study analyzed the feasibility of informal carpooling/ride share and a fixed route service for bicyclists and pedestrians. In that same year, bridge specialists Burgess & Niple carried out the semi-annual fracture critical inspection of the bridge. Mowat Construction completed the Bridge Span Lock repair. In October 2010, ODOT completed its semi-annual underwater inspection of the bridge and noted three areas of concern: cable stays on teh upstream side of piers are deteriorating; exposed portions of concrete footing have continued to deteriorate, exposing some re-bar; and “ghost” fishing nets have snagged piers in a couple of locations. In November, the Port approved a contract with HNTB Engineers for a longevity study of the bridge, focusing on the useful life of the bridge, capital repair/replacement costs, and maintenance assumptions of all bridge components. In March of 2011, HNTB engineer David McCurry presented the Long Term Operations Model to the Port Commission. In August of the same year, the bridge painting project began at the northern end of the bridge, with an estimated cost of $250,000 per span. The project was completed in December of 2012 by S&K Painting over six months ahead of schedule. In September, the Port purchased bike racks for Mt. Adams Transportation’s fixed route shuttles across the bridge, in support of their Bike on Board program. In October the Port Commission authorized a bridge toll increase, raising the toll from 75 cents to $1.00 for standard vehicles, effective January 1, 2012. Also in October, the Port Commission supported a Memorandum of Understanding to recognize regional efforts for the SR-35 Columbia River Crossing Study, and the possibility of cooperation for the future replacement of the bridge. In October of 2012, HNTB Engineers presented their study evaluating the feasibility of adding a bicycle/pedestrian path to the Hood River Interstate Bridge. The study concluded that, with the limited weight capacity of the bridge’s steel trusses, such an addition would impact weight load and would likely cost about $10 million. In April of 2014 a major bridge deck maintenance welding project was completed, with budget allotted for future repairs as needed. In June, Port Director Michael McElwee gave a presentation about the Hood River Bridge at the Pacific Northwest Waterways Association annual conference in Coeur d’Alene. The Port Commission considered a Budget Committee recommendation to discontinue sales of prepaid toll tickets and a modification to discounts given to BreezeBy customers. An electronic speed sign was installed on the bridge in an effort to slow southbound traffic near the tollbooth. Also in 2014-2015, the Port collaborated with GorgeTranslink and Mt. Adams Transportation Service to promote the Bike on Board program, providing an alternative for bicyclists to get a ride across the bridge. In September, the Port contracted with HDR Engineering, Inc. for tolling system upgrade management services; in November HDR conducted an inspection of the bridge’s moveable lift span as part of a separate contract. In 2009 The Port commission approved the Waterfront Business Park Design Guidelines to achieve high standards for development of the Hood River waterfront. In July, Cascade Equipment of Carson, WA was awarded the Anchor Way industrial street project, which included streetscape improvements on Portway Avenue. The project was funded in part by U.S. Economic Development Administration and the Oregon Department of Transportation Immediate Opportunity Fund. In September, the Port extended $2,000 worth of bridge toll tickets to students of Columbia Gorge Community College’s Certified Nurses Aide students and related healthcare professions in recognition of the critical economic development role a well-trained heathcare workforce provides. Also in September, the Port accepted a $64,500 grant from Pacific Power for the Halyard Building 23kV solar array; in January 2011, the Port received an additional $28,750 in funding support from Energy Trust of Oregon for the solar system. In October the Port hired Robinson Construction to construct the Halyard Building, and contracted with Milstead & Associates for construction management services. In January 2010, Insitu, Inc. began a five year lease for 12,675 square feet on the second level of the Port’s Big 7 Building for testing and repair of unmanned aerial vehicle products. In April, a Waterfront Marketing Plan and Budget was approved and conditions outlined for disposition of properties south of Portway Avenue. In May, the Port purchased the Jensen Building at Waterfront Business Park. In June, the Port hired Columbia Planning + Design for services to modify zoning on Lot 1 at the Waterfront Business Park; a portion of the lot was zoned Industrial and the Port sought LI zoning for more flexibility in uses. In September, Key Development’s Jeff Pickhardt presented a prospective plan for Lot 8 redevelopment of the Port’s UTS Portsite Building. In October, three Disposition and Development Agreements (DDAs) were approved by the Commission for the sales of Lots 2, 7, and 8 at the Waterfront Business Park to Key Development. The City of Hood River’s Waste Water Treatment Plant improvements were completed in the same month. Improvements to the Big 7 Building were made in December to accommodate Electronics Assemblers’ growth. RBS Battens moved into newly remodeled spac at the Jensen Building in the same month. In February of 2011, Port contractor Group MacKenzie submitted a Lot #1 Traffic Analysis to the Port. The study evaluated the potential traffic impact of a campus-scale development at the site to be incorporated into ODOT’s Interstate Access Management Plan. In July of the same year, Real Carbon became the first tenant of the completed Halyard Building. In September, a DDA was approved for the sale of Lot #3 at Waterfront Business Park to Key Development for the construction of a commercial building. In November, the Port approved a design plan submitted by Dean Cameron for a new building at Wasco Business Park. In April of 2012, the Portway Avenue Improvement Project was awarded to Crestline Construction Company, with a low combined bid of $343,797. EDA grant funds covered over $150,000 of the cost. In July, the Port awarded Griffin Construction the contract for improvements to the east end of the Marina Office Building to prepare incubator space for Gorge Innoventure. Also in July, Pfriem Brewing moved into 5,700 square feet of space in the east end of the Halyard Building. In addition to a tasting room/restaurant at the Halyard, Pfriem began their manufacture and distribution of craft beers throughout the Northwest. Following in January 2013, the Port approved a lease with PocketFuel, LLC for the last remaining space in the Halyard Building. In April of 2013, the Port hired consulting firm EcoNorthwest to prepare an Economic Impact Analysis of the Port itself; the study was completed in September of the same year and is available for download here. In June, the Port approved a lease for 5,000 square feet of space in the Timber Incubator Building with Wy’East Labs. In June, August, and September the Port held three public, stakeholder Special Session meetings to discuss ideas for the future development of Lot 1. In December of 2013 the Port Commission approved a DDA with Key Development for the Expo Center property. Following two public input meetings held in 2013, the Port Commission formally adopted its 2014-2018 Strategic Business Plan in January of 2014. Also in January, the Port contracted with Berger ABAM to prepare an application to change the comprehensive plan and zoning on portions of the Expo property from C2 to LI; an application for the zone change was submitted the following April for the 2.33 acre property. In May, the Port entered into contract for the purchase of the Hanel Mill site in Odell, subject to a due diligence period of five months. As part of the process the Port contracted with Coles Environmental Consulting for Phase 1 Environmental Assessment. In June, a lease was approved with Oregon Brineworks, LLC for 2,500 square feet of space at the Port’s Timber Incubator Building at the John Weber Business Park. Also in June, the Port supported the formation of a Gorge wide advocacy group, OneGorge to cultivate great collaboration in legislative advocacy. In January 2010, the Port Commission considered the Nichols Boat Basin Long-Term Planning, and decided to evaluate the basin’s habitat qualities, environmental qualities, shipping channel, recreational use, water quality, and other considerations. In March of the same year, the Columbia River Gorge Commission asked the Port to help publicize the impacts of water sports on Native American fishing activities. In May, the Port approved a one-year trial period for use of the Marina Swim Beach for kiteboard pumping, drying, and access to the Sandbar. Also in May, a Memorandum of Understanding was updated for the cooperative management of the Delta, approved by the Oregon Department of State Lands, Columbia Gorge Kiteboarding Association, Columbia Gorge Windsurfing Association, and the Port. John and Sharon Chow were tapped as Event Site hosts for the summer season and began living in a motor home on site each summer through Labor Day, providing round the clock host services. In April 2011, the Port Commission weighed multiple parking changes in the Event Site area, and agreed on a new parking plan. The Commission also decided to offer annual Event Site parking passes at discounted rates through May 31. In May, new signage was installed at the Event Site, Nichols Basin and Marina Beach. Liz Whitmore signed on as the Port’s new Waterfront Coordinator in May of 2012, becoming the public’s main contact for all waterfront recreation development, maintenance, and planning. In the same year, the Port initiated a public outreach process regarding the Naito Development’s proposed cable park at Nichols Basin. After four months and two public meetings, the Port Commission voted not to lease a significant portion of Nichols Basin to Naito Development for the cable park. In September 2012, a Request for Proposals process was initiated to select kiteboarding, windsurfing and SUP concessions at the waterfront for the 2013-2015 term, with a plan in place to lessen crowding at the popular multi-use Event Site. In January 2013, the Oregon State Marine Board held a public hearing at the Port’s January 22 meeting to receive public comment on the Port’s application for buoys for the Event Site “No Wake Zone.” Also in January, Port staff submitted two grant applications seeking funds for a new pedestrian/bike path and open green space along Nichols Basin’s west edge. In February, Waterfront Coordinator Liz Whitmore presented the Commission options for the Event Site High Water Plan. In March, the Commission voted to increase recreation site parking fees to $5 for a daily pass, as recommended by the Waterfront Recreation Advisory Committee. The purpose of the increase was to help cover maintenance costs. In June, new parking at the City-owned Hood River Waterfront Park was constructed with a loan from the Port. In January of 2014, Terra Surveying completed a base survey for the west edge of Nichols Basin to help inform final path/park design work. Also in this month a contract with simp.L LLC was approved for schematic design services for the Hook Trail extension project. In February, the Port’s Waterfront Recreation Advisory Committee reviewed and offered recommendations on preliminary design concepts for the Hood Launch and Trail and the Pedestrian Bridge Bike/Ped connections, among other topics. In March and April the Nichols Basin West Edge Project Advisory Committee met several times to review two conceptual plans for the bike/ped trail, water access, and areas for upland development. Consensus was to implement features from each design into a final design concept. In May, the Port was awarded a $445,000 grant form the Oregon Parks and Recreation Department Local Government Grants Program for the Nichols Basin West Edge Trail Project. Also in May, a new Waterfront Emergency Access Points signage system was developed and implemented by the Port, CGWA, CGKA and Hood River Fire Chief Devon Wells to improve location identification for emergency response.